RV owners in Redland, California, like to have options. Options give owners the freedom to park their camper or other recreational vehicle when they're not using it and not pay for storage when they are out on the road. At Vines Storage, our facility not only offers great amenities and flexibility in regards to space, we also offer excellent leasing options. Clients are thrilled to find out that we can customize a storage solution to exactly what they need. Whether you need a permanent place to park your RV between weekend trips because your neighborhood doesn't allow driveway RV parking, or if you need a short-term lease between seasons, you will find the pricing and amenities to be more than fair at Vines Storage. Our storage facility offers both indoor and outdoor storage for RVs. Both storage options offer plenty of space, however, the indoor units also offer protection from weather elements and rodents. The facility is secure with round the clock cameras and surveillance. Further, the entire facility is protected with an 8-foot wall, key-code entry and the latest alarm technology. Individuals who enter the facility do so past a secure entrance where they are seen by our staff. Clients can rest assured that their recreational vehicle, along with any items inside, will be safe. 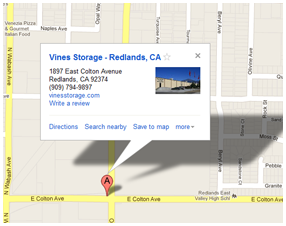 In addition to great space and security, Vines Storage also offers convenience and amenities. The facility is open from 8am until 7pm, seven days a week. Further we offer amenities such as an ice maker, filtered water, purified water, an air compressor, a place to charge your battery and a sewage waste dump site. Vines Storage offers many great leasing options from short-term to long-term, inside or outside, and of various size. To learn more, call Vines Storage or stop by today. Once you view our facility and talk to our representatives about your needs, we are sure that you'll find that storing your recreational vehicle at Vines Storage offers you the safety, comfort, and security that you need.